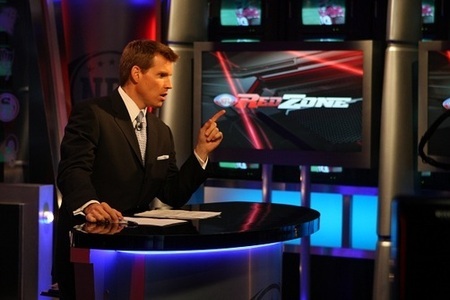 Scott Hanson from the NFL Network presides from the pulpit of America's fastest-growing socio-religious phenomenon: The NFL Red Zone. – Maybe, and I relish every minute of it. – We have absolutely no idea. – Possibly, but it’s still too early to tell. – We are divided on this. Part of us wants to see The Gunslinger absorb this horrible chapter in his career and bounce back to finish with dignity. However, we remain torn and wish to see the salacious Favre Express train wreck continue to fester and witness his exit from the game having tarnished his legend. OK, at this point, we want to see the latter. Among all of these questions, few answers are to be had. But there is one infallible certainty in this young season: the NFL Network’s Red Zone channel is absolutely fantastic. In fact, it is beyond fantastic. For me, it has revolutionized the way I watch football. And to think this was all an unintended consequence from expanding my cable service in an attempt to catch one or two University of Utah football games on obscure channels leads me to believe this discovery was nothing less than divine providence. Non-stop action. Of every game. And it’s live. And when I say “action,” I mean actual action. As the term “red zone” implies, this is defined as the 20% of a football game that provides the viewer with suspense and excitement, not the soporific battles of punting for field position, endless commercial breaks, and meaningless sideline reports from another attractive female airhead employed by FOX/NewsCorp. Avoid the sports bar and obnoxious Dallas Cowboys fans, and stay home to watch the games on NFL Red Zone. Granted, sometimes too much action is not good. I have watched football in sports bars that feature the NFL Sunday Ticket package on more than 30 flat-screen TVs and the overstimulation of that many different games going on at once made me feel like an eight-year-old addled with ADHD on the candy aisle at Walmart during Halloween. I also suffered from near whiplash trying to follow the action, as announced by the cheers bellowing from behind, to the sides, and all around me. With the Red Zone, you see all of that on one screen—your screen. 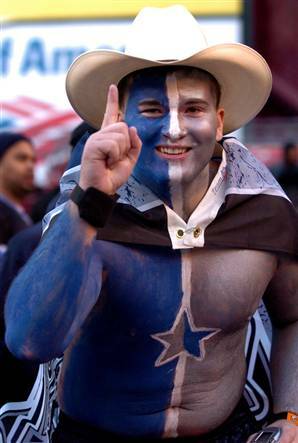 You also avoid the horrors of being surrounded by a host of annoying fans that include portly chumps clad in New York Giants jerseys, gum-popping floozies in pink Tom Brady jerseys, and perhaps the most deplorable species of football fanatic known to mankind: Dallas Cowboys fans. In case the meaning of “action” is ambiguous, let me be clear: I am talking about touchdowns, folks. This is where NFL Red Zone delivers more efficiently than anybody else. With 12 games in the Sunday rotation, host Scott Hanson and his well-oiled production crew provide the viewer with only the most delectable morsels that football has to offer while sparing us from the overwhelming amounts of fat and gristle that proliferate on common telecasts. In addition to being a sheer touchdown binge, key situations like attempting a third-and-short conversion and two minute drills are given their due spotlight. Even field goals are more enjoyable to watch on the Red Zone. This is more than highlights; it’s splicing together the most important moments of a dozen games into a live medley of the week’s greatest hits. For those of you living in a town in which you dislike and/or detest the local franchise, you have the option to watch your team(s) in the “out-of-market” games—an opportunity of which you are deprived under current NFL television contract stipulations. For me, that means I now have a superior alternative to watching Mike Shanahan berate a mammoth lazy slob in Albert Haynesworth during Washington Redskins games. Instead, I can now laugh heartily at Haynesworth’s plight while watching the Saints march through a weak NFC South and masochistically enjoy another dead-end season for the Niners. My remote control is much happier with the presence of NFL Red Zone. This has immediately taken the heat off its “last channel” button that used to be constantly pressed on an average of 47.8 times each hour while flipping between channels on Sundays. The wife also appreciates the departure of the strobe light effect that this behavior produced. However, I cannot promise my remote control unequivocal safety or indemnity. With the Red Zone in the house, I am now more likely to witness a Saints letdown in the 4th quarter or another 49ers meltdown (though the latter is beyond the point of infuriating, reaching the demented realm of hilarity). Conversely, I am also guaranteed to see the Cowboys continue their season of fail with a smile on my face, marvel at another Brees touchdown drive, laugh out loud at another Brett Favre interception, cheer on my fantasy squad with each touchdown, and enjoy the carousel of live coverage that can only be found in one place—the Red Zone. All of this makes me happy, as embarrassing or shameful as it may be. And when I am happy, my wife is happy and all is well with the world. So I say to the neophytes among you who have yet to discover the treasures that lie beyond the metaphorical 80 yards of hinterland in your lives: Cast out the demons found in regular football broadcasts, end the torment of evil GEICO insurance commercials, bear witness no more to delays caused by instant replay reviews in the booth, and experience the enlightenment found only in the Zone of Red. You will be forever changed. This entry was posted in Sports and tagged NFL, NFL Network, Red Zone, touchdown by Troy Beckman. Bookmark the permalink. Plus, Scott Hanson is hot. Yeah, I guess he kind of is, from a certain perspective. I jst lyk teh Nlf footbla. -Did I tell you a friend of mine slept with Scott Hanson when he used to work for DC area Comcast sports? His teeth apparently look bigger in real life. He does a great job hosting. -I cannot say enough good things about the Red Zone. This is my 3rd season with this channel and I don’t remember what it was like to watch one game at a time, only occasionally heading back to the studio for a “Game Break” with Curt Menefee. -The first year it took a hot second to get used to no commercials, but now the lack of exposure to the Fox Sports Robots is greatly appreciated. -It is good, good times to watch all my fantasy team players score in real time rather than checking Yahoo. -To be fair to Shanahan, Haynesworth has only been active for 3/6 the six games so he can’t be spending that much time berating him on the sidelines. Maybe he’ll be gone by tonights trade deadline? A ‘Skins fan can only wish. I almost forgot about the Fox Transformer Robot Football Players.